It is a fact that coyotes have evolved since the advent of European settlement. They have gone from living out in the wild West, mostly by themselves, to evolving the intelligence, sleuthfulness and perception to co-exist prosperously yet mostly hidden from human populations all over the North American continent. Coyotes are first cousins with the dog, fox, wolf, and hyena to name a few, but none of these groups except perhaps the wild fox has evolved to co-exist in relative secrecy with human settlements like the wild coyote. These guys are Superdogs : the upper frequency limit of hearing for coyotes is 80 KHz, compared to the 60 kHz of domestic dogs, a heart beat is very very loud! Coyotes also enjoy keen vision and a strong sense of smell making them formidable hunters. They can run up to 40 miles (64 kilometers) an hour. If their member numbers drop due to external circumstances coyotes start having bigger litters of pups to fill the gap. They have a social order and work together as families and can eat absolutely anything organic for nutrition. A feral cat population around predators also evolves very perceptive cats that learn to avoid being eaten. All the same, it is heart-breaking when old time favorite feral cats disappear with reported coyotes sightings. People with indoor domestic cats should especially keep them inside--the indoor royalty doesn't stand a 2 second chance against these wild animals: incredibly savvy and extremely well adapted for life in suburban and urban environments, they are here to stay. ...Despite being extensively hunted, trapped and poisoned the coyote is one of the few medium-to-large-sized animals that has enlarged its range since human encroachment began. Their original range was primarily in the western half of North America, but adaption has occurred and since the early 19th century the coyote has been steadily and dramatically extending its range. Sightings now occur in all over the North American Continent. Coyotes have created a new niche for themselves by adapting to human populations as well as filling niches once occupied by less adaptable animals such as wolves. Coyotes thrive in suburban as well as urban settings. A study by wildlife ecologists at Ohio State University yielded some surprising findings in this regard. Researchers studied coyote populations in Chicago over a seven-year period (2000–2007), proposing that coyotes have adapted well to living in densely populated urban environments while avoiding contact with humans. They found, among other things, that urban coyotes tend to live longer than their rural counterparts, kill rodents 42% of their diet, and live anywhere from parks to industrial areas. The researchers estimate that there are up to 2,000 coyotes living in "the greater Chicago area" and that this circumstance may well apply to many other urban landscapes in North America. In Washington DC's Rock Creek Park, coyotes den and raise their young, scavenge roadkill, and hunt rodents. "I don't see it as a bad thing for a park," the assigned National Park Service biologist told a reporter for Smithsonian Magazine (March 2006). "I see it as good for keeping animal populations in control, like the squirrels and the mice." As a testament to the coyote's habitat adaptability, a coyote (known as "Hal the Central Park Coyote") was even captured in Manhattan's Central Park in March 2006 after being chased by city wildlife officials for two days. ● Keep an eye on your pets. Don’t allow them to wander from the yard. ● Don’t leave pet food bowls outdoors. Even bringing them in at night won’t work. Coyotes are drawn to the lingering scent of pet food. ● Get lock-top garbage cans. ● Attach garbage cans to the house or fence, or build an enclosure for them. ● Revise ordinances, where applicable, to require garbage containers outside restaurants to have locking tops. ● Require homeowners to place their garbage on the curb only on the day crews pick up — not the night before. ● Establish a leash law for cats. 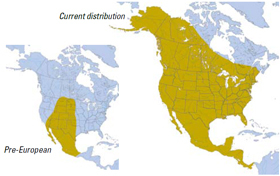 ABOVE: Coyote Pre-European and present distribution from page 7 of Chicago Coyote Radio Collar Study. 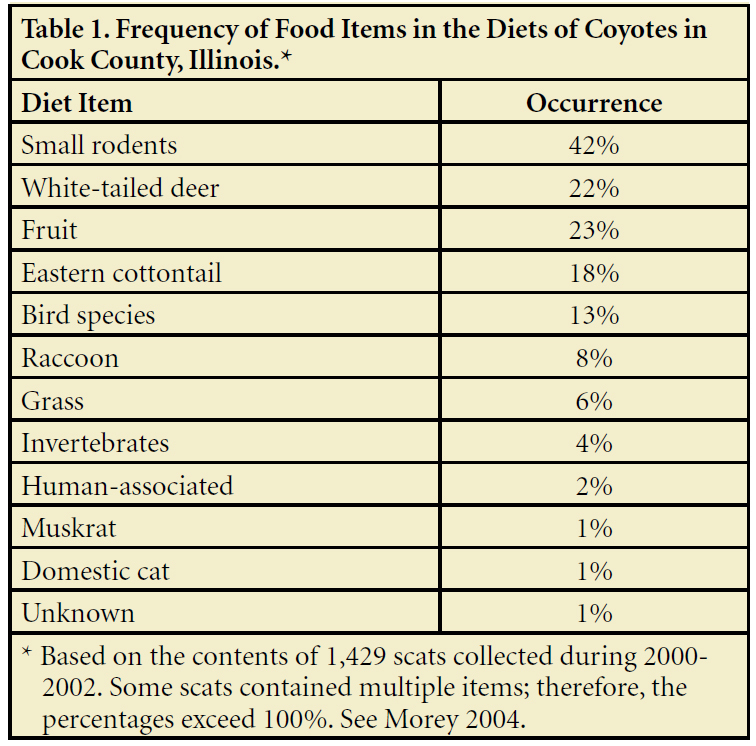 ABOVE: 1,420 Coyote Scats analyzed on page 15 of Chicago Coyote Radio Collar Study. 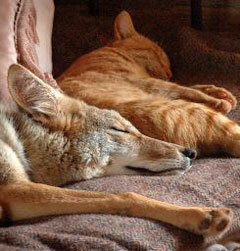 ABOVE: Charlie the coyote and Eli the cat from The Daily Coyote Blog www.dailycoyote.net/. 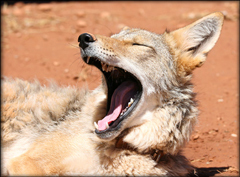 ABOVE: Charlie the coyote yawning in the sun from The Daily Coyote Blog www.dailycoyote.net/.